If you are planning to enhance the appeal of your outdoors, concrete structures can make a lot of difference. From driveways to patios and decks, they look beautiful and are long lasting compared to natural stone and other materials. For reliable and high quality concrete installation in Ancaster, you can put a trust on our general contractors at Reinforced Concrete. Being your local stamped concrete company, we aim to make your outdoors look more pleasing and modern. Right from the driveways to pool decks, you can rely on us for durable structures that tend to last for years to come. Not only this, we provide concrete repairs and maintenance to keep your outdoors in shape. With us, you can rest assured as you’ll always get the best-in-class services, no matter, what service you want us to do. We strive hard to go beyond your expectations by creating a stamped concrete or a broom finish concrete patio in Ancaster that will stay in shape for years to come. Right from repairs to new installations, we handle every aspect of your concrete project with ease. 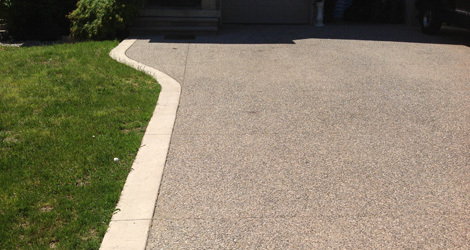 We are licensed and insured concrete contractors who feel proud in installing and constructing amazing quality concrete driveways and sideways. Contact Us For Superior Concrete Services!